A FUN, HANDS-ON PROJECT! STUDENTS WILL REMEMBER THIS ONE! 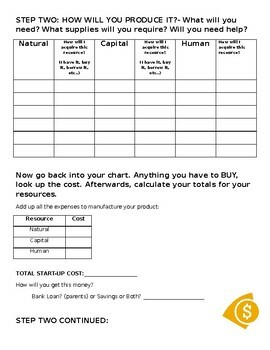 This activity is designed for students as a culmination to an economics unit. 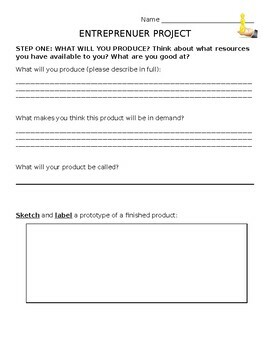 Students will create (with a small team) a real product to manufacture using their own resources. 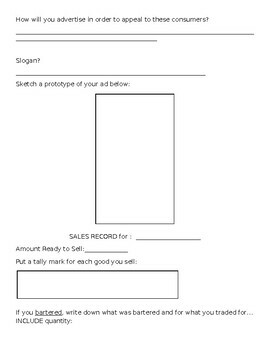 All worksheets needed to guide students through process are provided and editable! Class time should be provided in order for the team to be able to meet and manufacture. 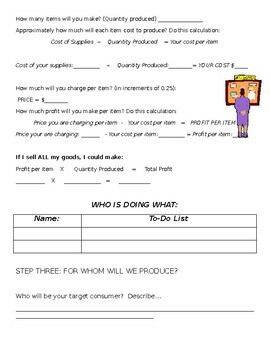 After roughly 2-3 days of preparation, students may sell to each other in the class, or the teacher can invite other students to come and buy from the “businesses” in the product market. *REAL money is exchanged in order to purchase the goods* Teacher should meet individually with groups to make sure their information is accurate on their forms and their ideas are feasible. An “essential question” is posed at the end of the project as a form of assessment and reflection. *Students LOVED this project and were still talking about it at the end of the year!